Now that The Walking Dead is a huge hit, there’s another Robert Kirkman comic coming to TV: Outcast, the tale of a man whose loved ones have been plagued by demonic possession since he was a child. 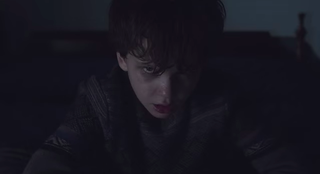 The first trailer showed today at San Diego Comic-Con, giving us a taste of the new supernatural horror show. Chris Black, Outcast’s showrunner, and Adam Wingard, who directed the pilot, were at the panel along with the three main cast members. Wingard said that he wanted to work on Outcast because exorcism is a horror subgenre he hasn’t tackled yet, although he admits a little trepidation about it. The only good exorcism drama, in his opinion, is The Exorcist; it’s an easy concept to get wrong. But he says that it’s akin to The Walking Dead in that the story is less about the supernatural threat itself than it is about people’s reactions to the supernatural. The comic and the TV show have been developed concurrently, and Black said that he’s enjoyed collaborating with Kirkman. (Even if the TV writers were frequently waiting on Kirkman.) He said that Kirkman recognizes that the TV show needs to have its own life, independent of the comic. “Robert is respectful of that process,” he said, as long as the TV writers stay true to the comic’s characters. Outcast will premiere in 2016 on Cinemax.